Thank You For Submitting an Order Request. Someone will be contacting you shortly. If you have any questions please feel free to call 1-866-COOKIE-9. All checks should be made payable to: Cross International. Click here to read about Cross International and where our proceeds go. This form is provided for your convenience to order gift trays for your company or yourself to give as year end gifts to employees, clients, vendors and friends. 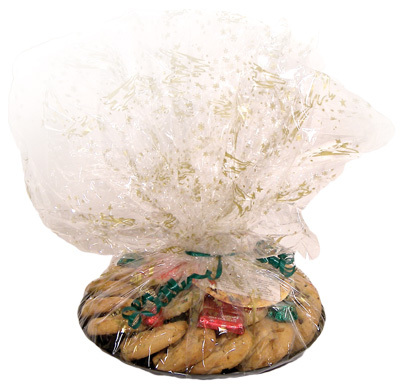 Each gift tray comes with chocolate chip, peanut butter and snickerdoodle cookies (8 each) and an assortment of Hershey's candies all wrapped up nicely in festive cellophane and tied with a bow. A unique gift card describing The Cookie Sale is also included. If you want to buy cookies and are not affiliated with a business or organization, please email cookie@thecookiesale.com. We will have someone contact you directly to confirm your order and provide any further information you may need. Please click here to view our cookie gift tray. The cost of a cookie tray is $15. A $8 shipping and handling fee will be added to each tray that you have us mail. If you are including a special gift from your company, there may be an increased shipping fee due to the weight of the item, please call for approval. Please note that all gift tray orders and any items you want to include must arrive to us by Monday, November 26, 2018! If you have any questions please feel free to call 717-509-7399 or 1-866-COOKIE-9. How Many Cookie Trays Would You Like? Mugs and company holiday cards make excellent items to put in a cookie tray. *Gifts to be included must be received by Monday, November 26, 2018. Drop Ship Trays To Your Customers? Ship Trays To Address Specified Above? Where Do I Send The Gifts I Want Included In The Trays? Someone will contact you by phone or email regarding where to send your gifts. How Do I Get You The Addresses For The Drop Shipping? Someone will contact you by phone or email regarding your mailing list/labels.